We are so happy to get to see our babies as they have grown. Thank you to all of our new owners for staying in touch and sending updated photos. Thank you for the kind words you have shared with us. 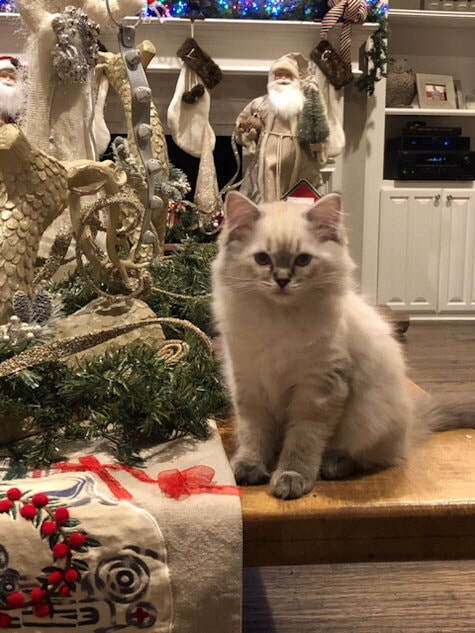 "​We purchased our Ragdoll kitten the day after Christmas! Working with Amy at Texas Blue Rags has been one of the best experiences I have ever had with a cat breeder. Amy had all of the qualities you hope to find. She will communicate with you via email and text to let you know which kittens are available. Then once you have chosen your kitten she will still be in constant communication with you. She sent me updates often on our kitten like photos and videos. It was so exciting! I had my parents visit Amy and our kitten we preferred before we officially chose him. My parents were so impressed with Amy and her husband’s professionalism, immaculate home, attention to detail and the obvious care they had when placing their precious Ragdolls with new families. They treated my parents with open arms, a hot cup of coffee, and great conversation. When we went to pick up our new kitten Amy was so organized! She had all of his information in a folder. It included his breed info, shot records, any other veterinary medical records and even his genetic testing!! I was so impressed! She even had some food for me to take to get him started along with a blanket that had all the smells from her home to help in his adjustment to our home. I could tell Amy really cared about her cats and she wanted to raise healthy and well adjusted pets. We named our kitten Sparky and he is truly amazing. I can’t tell you how much we love him! Amy and her husband already had him socialized with children and even dogs! This was great because we have three boys and a dog and Sparky adjusted SO WELL!! I call him a KOOL KAT because he honestly is the coolest cat!! He’s almost like a dog. He loves being around us and snuggles with my boys at night. He even likes to flirt with the dog! :) Plus, he is so handsome, stunning and gorgeous. We love him so much and our experience with Texas Blue Rags was so positive that we hope to one day purchase another kitten from this wonderful family. Thank you Texas Blue Rags for being kind and responsible Ragdoll breeders! 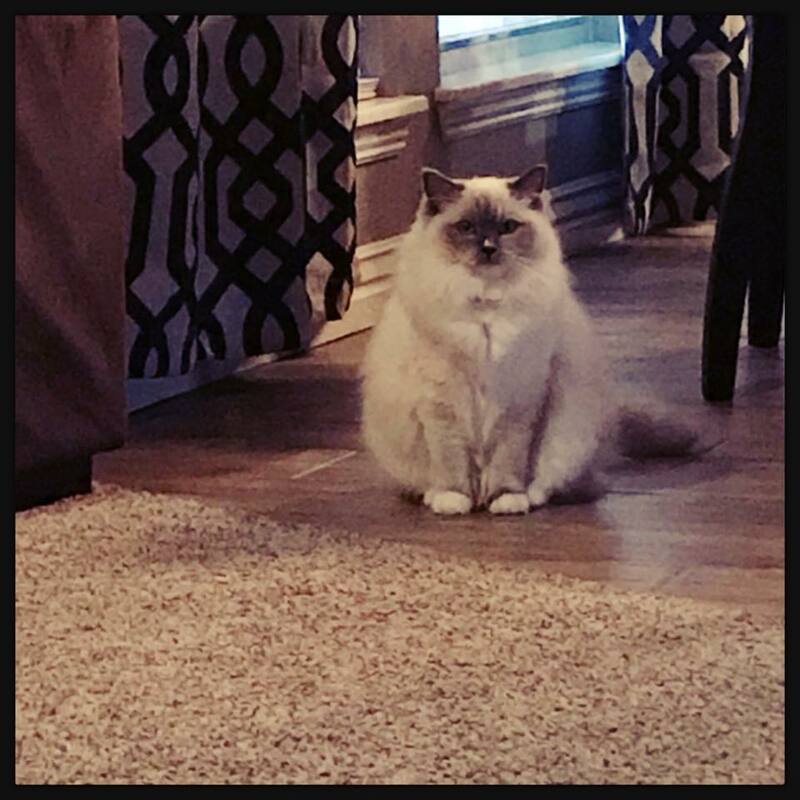 Our Ragdoll Sparky is so KOOL he even has his own Instagram page called @ragdoll_sparky_clark_griswold/ or you can click on the direct link: https://www.instagram.com/ragdoll_sparky_clark_griswold/"
"I met Amy through another very reputable ragdoll breeder. She was mentoring Amy with her first litter of kittens. I had unexpectedly lost my first, 12 year old ragdoll and was broken-hearted. I truly feel Amy and her kittens were a€ God Thing for me. It’s like I was supposed to have one of her babies! The timing was perfect. I went to visit her kittens and fell in love with them immediately . Her cats are so loved by her family and are very well taken care of. They are loved on from the time they are born until they go to their forever homes. Amy’s home was spotless and her family is so sweet. She truly cares about her furbabies€ and wants to make sure they are going to very good homes. I knew I had found the place where my new baby would come from! We love our Winston Furchill and are hoping for another kitten very soon." "Texas Blue Rags exceeded my expectations from the beginning. After an unfortunate experience with another breeder, I had a lot of questions that Amy was more than willing to address. She truly loves these kittens, and is very knowledgeable about all breeder concerns. My kitten came with excellent documentation, and was cleared by my vet as one of the healthiest kittens he’d met. She let me see where the kittens are raised and it’s clear they are well socialized and very well cared for. Since I took him home, she has been very responsive and excellent with communication. My kitten, Chadwick, is 6 months old and perfect. He’s social with guests and cuddles every morning. He “rag dolls” when you pick him up, has the most gorgeous blue eyes and coat, and came with absolutely no destructive behaviors. He is the least stressed cat I’ve ever met. He doesn’t run at sudden sounds or even flinch at my vacuum. He is always around me, the perfect combination of affectionate and playful. He is everything I wanted in a cat! I could never fit everything about my experience into one review. Please feel free to reach out if you have additional questions, or see one of these kittens grow up on Chadwick’s Instagram, @chadwick_the_cat. Your cat will be with you for years, it’s important that you make the right choice! For me, Texas Blue Rags was the perfect fit." "Amy is amazing as a breeder, from my initial contact with her she was always very quick to respond answering all my questions thoroughly. After we arranged an adoption she sent me updates on my little one with loads of pictures and we continued to talk about the breed and what she felt is best for them. When the day finally came for us to pick up our kittens Amy, her husband and children welcomed us with open arms into their home. They have a lovely, comfortable, clean home that is a perfect place for the babies. You can tell that the entire family loves the kitties and they are very well socialized. Amy set up a beautiful binder with all the pedigree information as well as the kitten's medical records and general breed information. This along with kitten food, blankets, toys and scratching posts were all part of our going home package. My fur babies, I ended up adopting two lol, are sweet, loving and just plain adorable! I would highly recommend Texas BlueRags to anyone looking to adopt a gorgeous Ragdoll." "My kitten is so well socialized, he wasn't even scared when I brought him home! ​ He is the sweetest, snuggliest little thing. Thanks so much!" "I highly recommend Texas Blue Rags! Amy truly cares about raising healthy, well adjusted ragdolls and matching your family with the right kitten. She recommended the perfect cat for our family with young children!" "Kittens are raised in very clean, well controlled environment. They are socialized to perfection. After we brought them home, there was no problems whatsoever with litter box or getting knowing our resident cats. She comes with perfectly health condition and purrfect temperament. I appreciate Vikki and Amy for entrusting us such beautiful girl and it means a lot to us. I am so impressed by Texas BlueRags. We picked up Sophie this week and she has adapted so beautifully to our home. I can tell that Amy and her family took great care of her. She's social, playful, happy and brings so much joy to our kiddos. Thank you so much from my family to yours! My whole experience with Amy has been outstanding! She is the best breeder I have ever met. She loves her babies and it shows. Tobi came home to us two days ago. She has transitioned in to our family, our cats and dogs so well! You can tell that Tobi was raised in a home environment, not caged. You can tell by how social, affectionate and loving she is. She has all the Ragdoll traits. Amy sent her home with a blanket. As you can see, she loves her blankie. We brought Milo home one week ago. He’s adjusted so well and it’s obvious that he was so loved and taken care of. We have a family full of animals and kids and Milo fit right in...just loving it all! I’m so appreciative to Amy and her family for entrusting us with this precious gift, and feel so fortunate to have had the opportunity to find the Texas BlueRags. 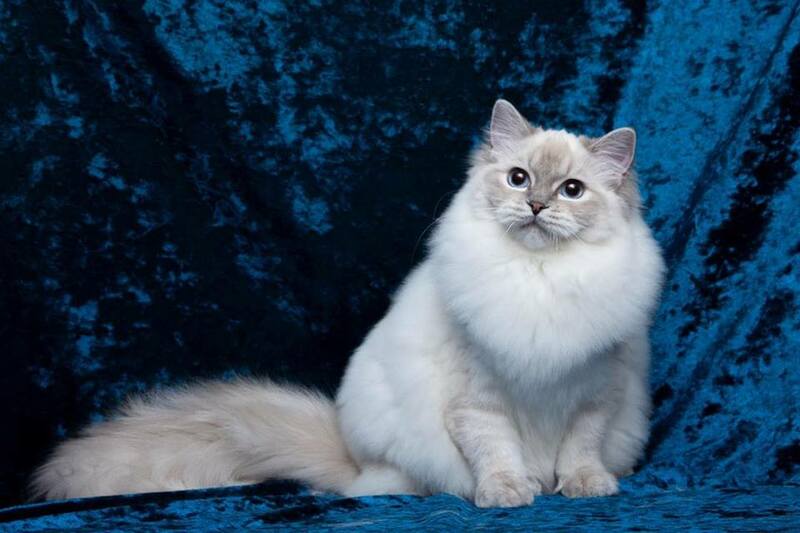 I would recommend anyone wanting a Ragdoll to connect with the Texas BlueRags family. I wanted to take this time to tell you what a blessing you have been with my entire adoption of my beautiful Thor. Throughout the entire process you kept me informed almost on a daily bases on how he was doing, growing and developing. The pictures and videos that you sent me made the experience priceless. No words can really say what a wonderful person you are and how you truly care about your kittens and cats and the future they will have. Because of how you handled Thor from the day he was born until this very second has made the difference in what a perfect angel God has blessed me with. I dreamed about getting a Ragdoll Kitten for a very long time and after years of begging, my husband finally agreed and now all I do is find him cuddling with my baby and then just putting a huge smile on his face. Thank you dearly for following through with everything you said you would be doing, and to my surprise you did it even more then what I really thought could be possible. You are by far someone I would highly recommend anyone to that is looking for a wonderful, beautiful, and perfect Ragdoll kitty to bring into their home. Thank you for bringing my little baby boy Thor into my home, he is the greatest baby I have ever had and I am so lucky to have such a beautiful kitten with so much personality. Please let me know if anyone ever needs a reference about you or your beautiful Ragdolls because I will be the first one to tell them all about what a wonderful adoption this will be for them. We just purchased our first Ragdoll and what a great experience it has been. You couldn’t ask for a more pleasant and knowledgeable person than Amy. From the first phone call to present she has been great. We got our little Pumpkin at 1 1/2 years old. She has just been retired from breeding and what an absolute love she is. It took all of one day for her to adjust to my husband and myself. Who knew that could happen? Now she runs our household. She’s so playful and lovable which tells you that she had been raised in a very loving environment. We are so fortunate to have met Amy and that we have our beautiful little Pumpkin.